Bates College is a private liberal arts college in Lewiston, Maine. Anchored by the Historic Quad, the campus of Bates totals 813 acres (329 ha) with a small urban campus and 33 off-site Victorian Houses distributed throughout the city. It maintains 600 acres (240 ha) of nature preserve known as the "Bates-Morse Mountain" near Campbell Island and a coastal center on Atkins Bay. With an annual enrollment of approximately 1,800 students, it is the smallest college in its athletic conference. As a result of its small student body, Bates retains selective admission rates and little to no transfer percentages. The nominal cost of attendance is considered very high with tuition frequently among the most expensive in the United States. The college was founded on March 16, 1855 by abolitionist statesman Oren Burbank Cheney and textile tycoon Benjamin Bates. Established as the Maine State Seminary, the college became the first coeducational college in New England and went on to confer the first female undergraduate degree in the area. Bates is the third-oldest college in Maine, succeeding Bowdoin and Colby College. 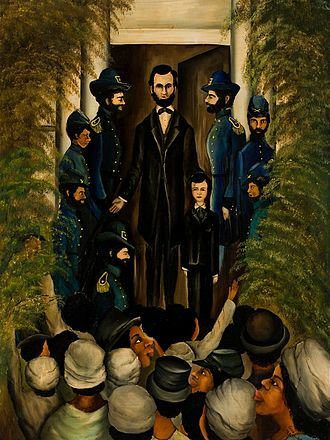 It became a vanguard in admitting minority students before the passage of the Emancipation Proclamation. During early 1900s the college began to aggressively expand and by the mid-1940s, amassed large amounts of property, becoming a major economic power in Lewiston. Since the 1950s, the college has acquired and attempted to remedy a reputation for educating the affluent of New England. Improvements to its reputation were diminished after large losses during the 2008 financial crisis increased its tuition costs. The late 2010s saw a redoubled push for socioeconomic, racial, and cultural diversity as well as a major expansion of student financial aid. Bates provides undergraduate instruction in the humanities, social sciences, natural sciences, and engineering and offers joint undergraduate programs with Columbia University, Dartmouth College, and Washington University in St. Louis. A baccalaureate college, the undergraduate program requires all students to complete a thesis before graduation, and has a privately funded research enterprise. Its most endowed departments of politics, economics, and environmental science are particularly noted within U.S. higher education. The Washington Post designates its undergraduate program as the 17th best in the country while Bates as a whole is the eighth best liberal arts college in the U.S., according to the 2018 Forbes tables. The students and alumni of Bates are well known for preserving a variety of strong campus traditions. Bates alumni and affiliates include 86 Fulbright Scholars; 22 Watson Fellows; 5 Rhodes Scholars; as well as 12 members of the U.S. Congress;[nb 2] 10 State Supreme Court Chief and Associate Justices; 7 Emmy Award winners; 5 Pulitzer Prize winners; 2 U.S. Cabinet-ranked officials; and numerous CEOs of Fortune 500 companies. The Bates athletic program has graduated 12 Olympians and 209 All-Americans and maintains 32 varsity sports, some of which compete in Division I of the NCAA. The college is home to the Bates Dance Festival, the Mount David Summit, the Stephens Observatory, and the Bates College Museum of Art. The college's oldest academic building, Hathorn Hall was built in 1856 by Boston architect Gridley J. F. Bryant. While attending (and later leading) the Freewill Baptist Parsonsfield Seminary, Bates founder, Oren Burbank Cheney worked for racial and gender equality, religious freedom, and temperance. In 1836, Cheney enrolled in Dartmouth College (after briefly attending Brown), due to Dartmouth's significant support of the abolitionist cause against slavery. After graduating, Cheney was ordained a Baptist minister and began to establish himself as an educational and religious scholar. Parsonsfield mysteriously burned down in 1854, allegedly due to arson by opponents of abolition. The event caused Cheney to advocate for the building of a new seminary in a more central part of Maine. With Cheney's influence in the state legislature, the Maine State Seminary was chartered in 1855 and implemented a liberal arts and theological curriculum, making the first coeducational college in New England. Soon after establishment several donors stepped forward to finance portions of the school, such as Seth Hathorn, who donated the first library and academic building, which was renamed Hathorn Hall. The Cobb Divinity School became affiliated with the college in 1866. Four years later in 1870, Bates sponsored a college preparatory school, called the Nichols Latin School. The college was affected by the financial panic of the later 1850s and required additional funding to remain operational. Cheney's impact in Maine was noted by Boston business magnate Benjamin Bates who developed an interest in the college. Bates gave $100,000 in personal donations and overall contributions valued at $250,000 to the college. The school was renamed Bates College in his honor in 1863 and was chartered to offer a liberal arts curriculum beyond its original theological focus. Two years later the college would graduate the first woman to receive a college degree in New England, Mary Mitchel. 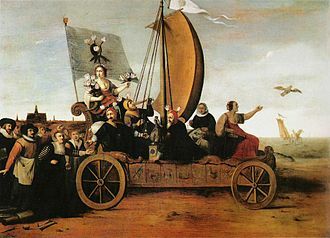 The college began instruction with a six-person faculty tasked with the teaching of moral philosophy and the classics. From its inception, Bates College served as an alternative to a more traditional and historically conservative Bowdoin College. There is a complex relationship between the two colleges, revolving around socioeconomic class, academic quality, and collegiate athletics. 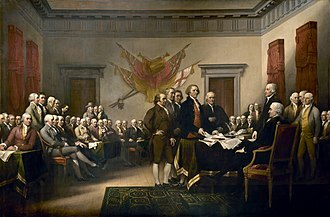 The college, under the direction of Cheney, rejected fraternities and sororities on grounds of unwarranted exclusivity. He asked his close friend and U.S. 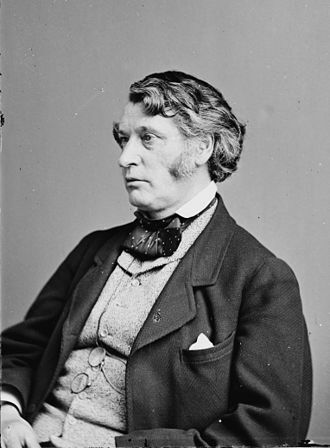 Senator Charles Sumner to create a collegiate motto for Bates and he suggested the Latin phrase amore ac studio which he translated as "with love for learning" which has been taken as "with ardor and devotion," or "through zeal and study." Prior to the start of the American Civil War, Bates graduated Brevet Major Holman Melcher, who served in the Union Army in the 20th Maine Volunteer Infantry Regiment. He was the first person to charge down Little Round Top at the Battle of Gettysburg. The college graduated the last surviving Union general of the American Civil War, Aaron Daggett. The college's first African American student, Henry Chandler, graduated in 1874. James Porter, one of General Custer's eleven officers killed at the Battle of Little Bighorn in 1876 was also a Bates graduate. In 1884, the college graduated the first woman to argue in front of the U.S. Supreme Court, Ella Haskell. Robert F. Kennedy, in front of Smith Hall, during Winter Carnival. In 1894, George Colby Chase led Bates to increased national recognition, and the college graduated one of the founding members of the Boston Red Sox, Harry Lord. 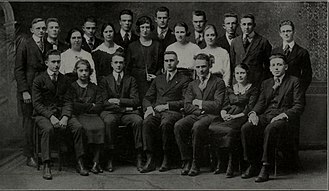 In 1920, the Bates Outing Club was founded and is one of the oldest collegiate outing clubs in the country, the first at a private college to include both men and women from inception, and one of the few outing clubs that remains entirely student run. The debate society of Bates College, the Brooks Quimby Debate Council, became the first college debate team in the United States to compete internationally, and is the oldest collegiate coeducational debate team in the United States. In February 1920, the debate team defeated Harvard College during the national debate tournament held at Lewiston City Hall. In 1921, the college's debate team participated in the first intercontinental collegiate debate in history against the Oxford Union's debate team at the University of Oxford. Oxford's first debate in the United States was against Bates in Lewiston, in September 1923. In addition during this time, numerous academic buildings were constructed throughout the 1920s. During 1943, the V-12 Navy College Training Program was introduced at Bates. Bates maintained a considerable female student body and "did not suffer [lack in student enrollment due to military service involvement] as much as male-only institutions such as Bowdoin and Dartmouth." During the war, a Victory Ship was named the S.S. Bates Victory, after the college. It was during this time future U.S. Attorney General Robert F. Kennedy enrolled along with hundreds of other sailor-students. The rise of social inequality and elitism at Bates is most associated with the 1940s, with an increase in racial and socioeconomic homogeneity. The college began to garner a reputation for predominately educating white students who come from upper-middle-class to affluent backgrounds. In the 1950s the college fenced off the campus in an attempt to "represent boundaries between Bates and Lewiston," to create a "symbolic separation between the purity of the Academia Batesina and underdeveloped city that surrounded them." 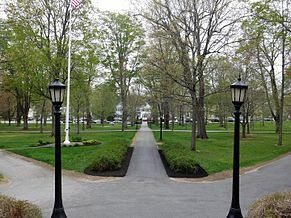 The New York Times detailed the atmosphere of the college in the 1960s with the following: "the prestigious Bates College — named for Benjamin E. Bates, whose riverfront mill on Canal Street in Lewiston was once Maine's largest employer — provided an antithesis: a leafy oasis of privilege. In the 1960s, it was really difficult for most Bates students to integrate in the community because most of the people spoke French and lived a hard life." View from the steps of Hathorn Hall during commencement week, outlooking the Historic Quad, directly facing Lindholm House, the admissions office. During this time the college began to compete athletically with Colby College, and in 1964, with Bowdoin created the Colby-Bates-Bowdoin Consortium. In 1967, President Thomas Hedley Reynolds promoted the idea of teacher-scholars at Bates and secured the construction of numerous academic and recreational buildings. 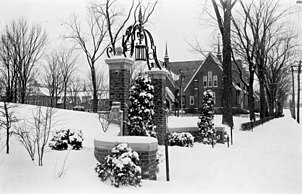 In 1984, Bates became one of the first liberal arts colleges to make the SAT and ACT optional in the admission process. Reynolds began the Chase Regatta in 1988, which features the President's Cup that is contested by Bates, Colby, and Bowdoin annually. In 1989, Donald West Harward became president of Bates and greatly expanded the college's overall infrastructure by building 22 new academic, residential and athletic facilities, including Pettengill Hall, the Residential Village, and the Coastal Center at Shortridge. During the 1990s (and mid 2000s), Bates consolidated its reputation of educating upper-middle-class to affluent Americans, which lead to a student protests and reforms to make the college more diverse both racially, and socioeconomically. Elaine Tuttle Hansen was elected as the first female president of Bates College and managed the second largest capital campaign ever undertaken by Bates, totaling at $120 million and lead the endowment through the 2007–08 financial crisis. The college announced her retirement in 2011, appointing Nancy Cable as interim president, to serve through June 30, 2012, while the college conducted a national search for its eighth president. In 2011, Bates made national headlines for being named the most expensive university in the U.S., which caused backlash from American academia and students as it in-directly highlighted substantial socioeconomic inequality among students. After a year-long search for the next president, Harvard University dean, Clayton Spencer, was appointed as Hansen's successor. Spencer assumed the presidency in 2012, and created diversity mandates, expanded student and faculty recruitment, and financial aid allocation. While some reforms were successful, minorities at the college, typically classified as non-white and low income students, still reported lack of safe spaces, insensitive professors, financial insecurity, indirect racism and social elitism. According to a 2017 article on income inequality by The New York Times, 18% of Bates students came from the 1% of the American upper class (families who made about $525,000 or more per year), with more than half coming from the top 5% (families who made about $110,000 or more per year). In October 2016, the college announced the construction of new facilities, residential dorms (Chu and Kalperis Hall), and the development new areas of study. According to the Portland Press Herald, Michael Bonney '80 and his wife donated $50 million to the college in support of the "Bates+You" fundraising campaign launched in May 2017. The campaign is the largest ever undertaken by the college totaling $300 million, with $168 million already raised as of May 2017[update]. Entrance to the college's inaugural library, Coram Library. Bates College is a private baccalaureate liberal arts college that offers 36 departmental and interdisciplinary program majors and 25 secondary concentrations, and confers Bachelor of Arts (B.A.) and Bachelor of Science (B.S.) degrees. Bates College enrolls 1,792 students, 200 of whom study abroad each semester. The academic year is broken up into three terms, primary, secondary, and short term, also known as the 4–4–1 academic calendar. This includes two semesters, plus a Short Term consisting of five weeks in the Spring, in which only one class is taken and in-depth coursework is commonplace. Two Short Terms are required for graduation, with a maximum of three. The largest social science academic department at Bates College is its Economics department, followed by Psychology, Politics, and History. The largest natural science academic department is the Biology department, followed by Mathematics, Physics, and Geology. Bates offers a Liberal Arts-Engineering Dual Degree Program with Dartmouth College's Thayer School of Engineering, Columbia University's School of Engineering and Applied Science, and Washington University's School of Engineering and Applied Science. The program consists of three years at Bates and a followed two years at the school of engineering resulting in a degree from Bates and the school of engineering. Entrance to Roger Williams Hall. Students at Bates take a first-year seminar, which provides a template for the rest of the four years at Bates. The student selects a specific topic offered by the college, and works together in a small class with a scholar-in-field professor of that topic, to study and critically analyze the subject. All first-year seminars place importance on writing ability, and composition in order to facilitate the process of complex and fluid ideas being put down on paper. Seminars range from constitutional analysis to mathematical theorizing. After three complete years at Bates, each student participates in a senior thesis or capstone that demonstrates expertise and overall knowledge of the Major, Minor or General Education Concentrations (GECs). The Senior Thesis is an intensive program that begins with the skills taught in the first-year program and concludes with a compiled thesis that stresses research and innovation. The Olin Concert Hall, houses keynotes, performances, and special debate tournaments. A feature of a Bates education is the Honors Program which includes a tutorial-based thesis modeled after the universities of Oxford and Cambridge. The program consists of a senior thesis that is defended against a faculty panel. A faculty member must nominate the student for thesis candidacy by the conclusion of their junior year. Under the guidance of the nominating faculty member, the student declares his or her thesis(s) at the start of senior year and concludes it before his or her graduation. The thesis is subject to an oral examination, which is loosely based on defending a dissertation or oral argumentation. The oral examination committee includes a member of the faculty from a different department, and an examiner who specializes in the field of study the student is defending and is usually from another institution. According to the U.S. National Science Foundation, the college received $1.15 million in grants, fellowships, and R&D stipends for research. The college spent $1,584,000 in 2014 on research and development. The Bates Student Research Fund was established for students completing independent research or capstones. STEM grants are offered to students in the science, engineering, technology and mathematics fields who wish to showcase their research at professional conferences or national laboratories. Independent research grants from the college can range from $300 to over $200,000 for a three-year research program depending on donor or agency. The college's Harward Center is its main research entity for community-based research and offers fellowships to students. According to a 2001 study, Bates College's economics department was the most cited liberal arts department in the United States. Bates College has been the site of some important experiments and academic movements. In chemistry, the college has played an important role in shaping ideas about inorganic chemistry and is considered the birthplace of inorganic photochemistry as its early manifestations was started at the college by 1943 alumnus George Hammond who was later dubbed "the father of the movement". Hammond would go on to invent Hammond's postulate, revolutionizing activation levels in chemical compounds. In physics, 1974 alumnus Steven Girvin, credited his time at the college as pivotal in his development of the fractional quantum Hall effect, now a pillar in Hall conductance. During the development and production of the first nuclear weapons during World War II, two students researching nuclear chemistry at the college were hired by the United States Army Corps of Engineers as part of the first Manhattan project scientific team. Atop the Carnegie Science Hall sits Stephens Observatory which houses the college's high-powered 12-inch Newtonian reflecting telescope. The telescope is used for research by the college, local government agencies, and other educational institutions. The Observatory is also home to an eight-inch Celestron, a six-inch Meade starfinder, and the only Coronado Solarmax II 60 in the state. As of 2017[update], Bates has a faculty of 190 and a student body of 1,780 creating a 10:1 student-faculty ratio and the average class size is about fifteen students. All tenured faculty possess the highest degree in their field. Full-time professors at the college received average total compensation of $123,066, with salaries and benefits varying field to field and position to position, putting faculty pay in the top 17% of all public and private universities. Bates College's faculty includes scholars such as political scientists Douglas Hodgkin, Stephen Engel, anthropologist Loring Danforth, historian Margaret Creighton, pianist and composer Thomas Snow, and author Steven Dillon. Past faculty members of the college include: philosophers David A. Klob and Louise Antony, historian Steve Hochstadt, ornithologist Jonathan Stanton, poet Fred D'Aguiar, English professor and first president of Reed College William Trufant Foster, U.S. Senator Porter Dale, economist Leonard Burman, visual artist William "Pope.L" Pope, musician Jody Diamond, and playwright Carolyn Gage. The college holds the annual Mount David Summit which serves as a platform for students of all years to present undergraduate research, creative art, performance, and various other academic projects and is named after the campus' Mount David. Presentations at the summit include various discipline-centered projects, themed panel discussions, films Q & A's, as well as other activities in the Lewiston area. Started in 2002, the summit is held in Pettengill Hall, and on April 1, 2016, held its 15th summit. For the class of 2022, the college admitted 1,685 students out of 7,685 applicants yielding a 17.8% admit rate, the lowest-ever for Bates. In the 2016 admissions rounds, all 170 transfer applicants failed to gain admission. In 2015, the college had a 1.6% acceptance rate for wait-listed students. U.S. News & World Report classifies Bates as "most selective", and The Princeton Review designated it with a "selectivity rating" of 96 out of 99. The college had its highest admit rate after the 2008 financial crisis, during the 2008-09 year, accepting 30.4% of applicants. Bates retained its lowest acceptance rate in the 2018-19 year: 17.8%. The average high school GPA was an unweighted 3.71 and a weighted 4.06. The average SAT Score was 2135 (715 Critical Reasoning, 711 Mathematics and 709 Writing), and the average ACT score range was 28 to 32. Bates has a Test Optional Policy, which gives the applicant the choice to not send in their standardized test scores. Bates' non-submitting students averaged only 0.05 points lower on their collegiate grade point average. For the 2016–17 academic year, Bates charged a comprehensive price (tuition, room and board, and associated fees) of $66,550. The college's tuition is the same for in-state and out-of-state students. Bates practices need-blind admission for students who are U.S. citizens, permanent residents, DACA status students, undocumented students, or who graduate from a high school within the United States, and meets all of demonstrated need for all admitted students, including admitted international students. During the 2016–17 academic year the college dispensed $37.9 million in financial aid with $4.3 million to undocumented students. Bates does not offer merit or athletic scholarships. Although Bates is often the most expensive school to attend in its athletic conference, the college covers 100% of financial need for students, and has an average financial package of $42,217. As of 2014[update], 44% of students utilize financial aid. Bates offers the Direct "+" Loan, Direct Student Loans, Pell Grants, Perkins Loan, Supplementary Educational Opportunity Grants (SEOG), and Work-Study Program. For the class of 2019, the gender demographic of the college breaks down to 49% male and 51% female. 27% of U.S. students are students of color (domestic and international) and 13% of admitted students are first generation to college. The educational background for admitted students are mixed: 49% of students attended public schools and 51% attended private schools. About 90% of this incoming class (of those from schools that officially rank students) graduated in the top decile of their high school classes. Bates has a 95% freshman retention rate. A significant portion of 45% of all applicants, transfer and non-transfer, are from New England. About 89% of students are out-of-state, (all 50 states are represented), and the college has students from 73 countries. 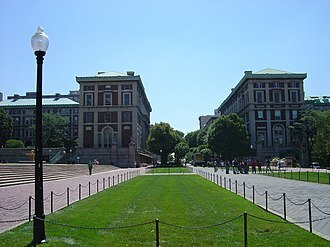 Bates is noted as one of the Little Ivies, along with universities such as Tufts, Bowdoin, Colby, Amherst, Middlebury, Swarthmore, Wesleyan, and Williams. The college is also known as one of the Hidden Ivies, which includes much larger research universities such as John Hopkins and Stanford University. In 2016, Bates was ranked 23rd among all liberal arts colleges in the country by Washington Monthly. The peak position Bates has held on the Washington Monthly ranking was 6th in 2013. Forbes ranked Bates 29th in its 2018 national rankings of 650 U.S. colleges, universities and service academies, putting the college the top 5% of institutions assessed. As a liberal arts college, Bates was ranked as the 8th best in the United States. The highest positioning Bates ever received from the Forbes ranking was as the 8th best liberal arts college and 29th best university in the United States (in 2018). For the 2017–18 academic year, Niche, formerly College Prowler, graded Bates with an overall grade of an 'A+' noting an 'A+' for academics, 'A+' for campus food, 'A+' for technology, 'A' for administration, 'A-' for diversity, and an 'A' for campus quality. As of 2015[update], Alumni Factor, which measures alumni success, ranks Bates first in Maine and among the top schools nationally. In 2018, Bates produced 23 Bates students who received Fulbright fellowships, attaining the distinction of "Fulbright Top Producer", and subsequently breaking the college's previous record, and ranking Bates first in the United States. In 2003, U.S. News & World Report ranked Bates 8th in the nation for criteria in admissions and its selectivity. The Fiske Guide to Colleges noted Bates as "highly selective and unconventional", later commenting that "Bates attracts many of the nation's brightest minds." In 2005, the college was ranked first for 'Best Value in the United States' by The Princeton Review. 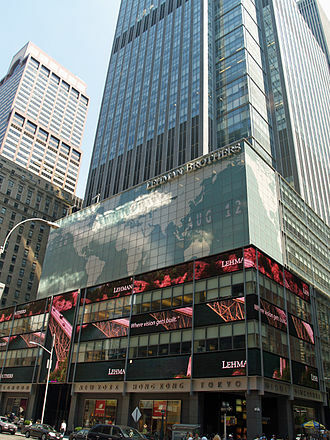 In 2003, The Wall Street Journal, put Bates in the top 15% of all colleges and universities in the United States in percentage of students entering the top five graduate programs in Business, Law, and Medicine. 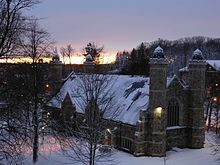 The college selected 10 colleges as its peers, namely Amherst, Bowdoin, Carleton, Yale, Williams, Wellesley, Middlebury, Pomona, Swarthmore, and Wesleyan. The Peace Corps placed Bates 22nd, out of all liberal arts colleges, for international charity involvement. In 2017, according to The Washington Post–a paper that aggregates university rankings from six different publications–the undergraduate program is the 17th best in the United States. On September 20, 2016, PayScale released a report of 1,000 universities and their average graduate earning potential for the 2016–17 year. A Bates degree was worth approximately $120,000 in average salary making it the 13th highest among universities, and the third highest among liberal arts in the U.S. In 2016, two Bates alumni were featured on the Forbes' 30 Under 30 list. Gomes Chapel, loosely modeled on King's College Chapel, Cambridge. Bates is in a former mill town, Lewiston, which has a large French Canadian ethnic presence due to migration from Quebec in the 19th century. The college is known for cultural strains with the town, townspeople describing Bates as a "leafy oasis of privilege." The overall architectural design of the college can be traced through the Colonial Revival architecture movement, and has distinctive Neoclassical, Georgian, Colonial, and Gothic features. The earliest buildings of the college were directly designed by Boston architect Gridley J.F. 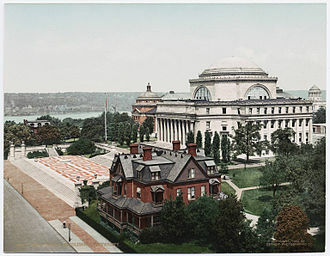 Bryant, and subsequent buildings follow his overall architectural template. Colonial restoration influence can be seen in the architecture of certain buildings, however many of the off campus houses' architecture was heavily influenced by the Victorian era. Many buildings on campus share design parallels with Dartmouth College, University of Cambridge, Yale University, and Harvard University. 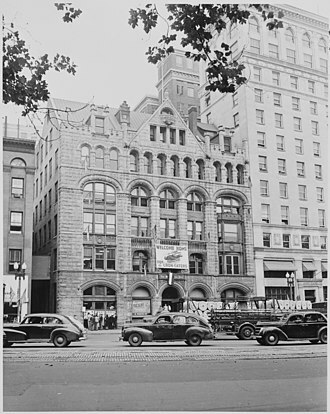 Chase Hall, the student activity center, served as the dining hall until the construction of the Commons. Bates has a 133-acre main campus and maintains the 600-acre Bates-Morse Mountain Conservation Area, as well as an 80-acre Coastal Center fresh water habitat at Shortridge. The eastern campus is situated around Lake Andrews, where many residential halls are located. The quad of the campus connects academic buildings, athletics arenas, and residential halls. Bates College houses over 1 million volumes of articles, papers, subscriptions, audio/video items and government articles among all three libraries and all academic buildings. The George and Helen Ladd Library houses 620,000 catalogued volumes, 2,500 serial subscriptions and 27,000 audio/video items. Coram Library houses almost 200,000 volumes of articles, subscriptions and audio/video items. Approximately 150,000 volumes of texts, papers, and alumnus work are housed within academic buildings. Hedge Hall, named after Isaiah Hedge, referred to by students as the Hog in reference to a Hedge Hog and its structural resemblance to Hogwarts. The most notable items in the library's collection include, copies of the original Constitution of Maine, personal correspondence of James K. Polk and Hannibal Hamlin, original academic papers of Henry Clay, personal documents of Edmund Muskie, original printings of newspaper articles written by James G. Blaine, and selected collections of other prominent religious, political and economic figures, both in Maine, and the United States. The campus provides 33 Victorian Houses, 9 residential halls, and one residential village. The college maintains 12 academic buildings with Lane Hall serving as the administration building on campus. Lane Hall houses the offices of the President, Dean of the Faculty, Registrar, and Provost, among others. The Olin Arts Center maintains three teaching sound proof studios, five class rooms, five seminar rooms, ten practice rooms with pianos, and a 300-seat grand recital hall. It holds the college's Steinway concert grand piano, Disklavier, William Dowd harpsichord, and their 18th century replica forte piano. The studios are modernized with computers, synthesizers, and various recording equipment. The center houses the departments of Art and Music, and was given to Bates by the F. W. Olin Foundation in 1986. The center has had numerous Artists in Residence, such as Frank Glazer, and Leyla McCalla. The Olin Arts Center has joined with the Maine Music Society, to produces musical performances throughout Maine. The Bates College Museum of Art in the Olin Arts Center. 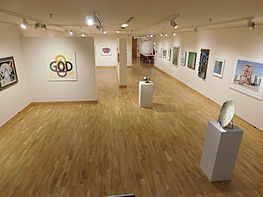 Founded in 1955, the Bates College Museum of Art (MoA) holds contemporary and historic pieces. In the 1930s, the college secured a private holding from the Museum of Modern Art of Vincent van Gogh's Starry Night, for students participating in the 'Bates Plan'. It holds 5,000 pieces and objects of contemporary domestic and international art. The museum holds over 100 original artworks, photographs and sketches from Marsden Hartley. The MoA offers numerous lectures, artist symposiums, and workshops. The entire space is split into three components, the larger Upper Gallery, smaller Lower Gallery, and the Synergy Gallery which is primarily used for student exhibits and research. Almost 20,000 visitors are attracted to the MoA annually. This conservation area of 600 acres is available to Bates students for academic, extracurricular, and research purposes. This area is mainly salt marshes and coastal uplands. The college participates in preserving the plants, animals and natural ecosystems within this area as a part of their Community-Engaged Learning Program. Due to overall size, the site is frequently used by other Maine schools such as Bowdoin College for their Nordic Skiing practices. This coastal center owned by Bates College, provides various academic programs, lectures, extracurricular activities, and research endeavors for students. 80 acres of wetlands, and woodlands with a fresh water pond, are available to numerous science departments and programs at Bates. There are two buildings on the land, a conference building, which can accommodate 15 people overnight, and a laboratory structured with an art studio on the upper floor. This area is also home to the Shortridge Summer Residency Program which provides students, faculty and researchers to work and study on the coastal land of Shortridge during the summer. Science majors and faculty work on site-based issues such as coastal changes, sea level fluctuations and public policy. The college's dinning complex, the Commons. The college's dining services have been featured on numerous national publications. In 2015, the college's dining program was ranked 6th by The Princeton Review, and 8th by USA Today in the United States. The college's dining services received the grade of 'A+' by Niche in 2012, 2013, 2014, 2015, 2016 and 2017. The college holds one main dining area and offers two floors of seating. The college also institutes 'The Napkin Board' where students may leave comments or suggestions written on napkins for the dining program and its staff. All meals and catered events on campus are served by Bates Dining Services, which makes a concentrated effort to purchase foods from suppliers and producers within the state of Maine, like Oakhurst Dairy and others. "The Den" serves as an on-campus restaurant. While on campus, enrolled students and faculty have access to round-the-clock emergency medical services and security protection that only stops if the student or faculty leaves the physical campus or withdraws from the college. The college also holds an annual "Harvest Dinner" during Thanksgiving that features a school-wide dining experience including a New England buffet and live musical performances. In 2015, shortly before the commencement of the Harvest Dinner, American rapper, T-Pain, performed. Martin Luther King Day at Bates is celebrated annually with classes being canceled, and performances, events, keynote talks are held in observance. It is a day marked by keynotes from well known scholars who speak on the subjects of race, justice, and equality in America. In 2016, the college invited Jelani Cobb, to speak at the college on MLK Day. The college offers students 110 clubs and organizations on campus. Among those is the competitive eating club, the Fat Cats, Ultimate Frisbee, and the Student Government. The largest club is the Outing Club, which leads canoeing, kayaking, rafting, camping and backpacking trips throughout Maine. Although Bates has since conception, rejected fraternities and sororities, various social groups exist. The Bates Student is the oldest coeducational college newspaper in the United States. 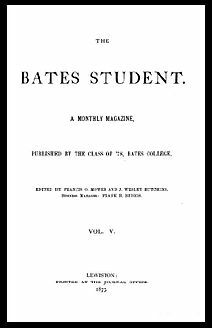 Bates College's oldest operating newspaper is The Bates Student, created in 1873. It is one of the oldest continuously published college weeklies in the United States, and the oldest co-ed college weekly in the country. Alumni of the student media programs at Bates have won the Pulitzer Prize, and have their later work featured on major news sources. It circulates approximately 1,900 copies around the campus and Lewiston area. 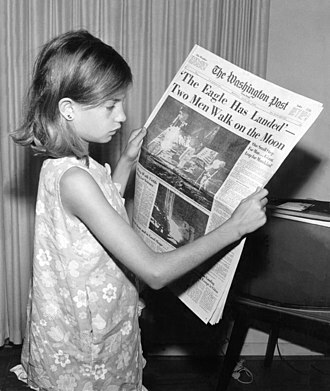 Since 1990, there has been an electronic version of the newspaper online. The newspaper provides access free of charge to a searchable database of articles stretching back to its inception on its website. WRBC is the college radio station of Bates College and was first aired in 1958. Originally started as an AM station at Bates, it began with the efforts of rhetoric professor and debate coach Brooks Quimby. It is ranked by the 2015 Princeton Review as the 12th best college radio station in the United States and Canada, making it the top college radio in the New England Small College Athletic Conference. There are five a cappella groups on campus. The Manic Optimists and the Deansmen are all-male, the Merminaders are all female and the coed groups are known as TakeNote and the Crosstones. Members of the Brooks Quimby Debate Council, named after Brooks Quimby, who served as a debate mentor to Robert F. Kennedy and Edmund Muskie. Arguably the most well-known student organization at Bates is the Brooks Quimby Debate Council, due to endowment allocation, relative participation rate, awards and historical significance. The formation of the team predates the establishment of the college itself as the debate society was founded within the Maine State Seminary making it the oldest coeducational college debate society in the United States. It was headed by Bates alumnus and teacher Brooks Quimby and became the first intercollegiate international debate team in the United States. The Quimby Debate Society has been noted as "America's most prestigious debating society," and the "playground of the powerful." During the 1930s, the debate society was subject to 'The Quimby Institute' which pitted each and every debate student against Brooks Quimby himself. This is where he began to engage heated debate with them that stressed "flawless assertions" and resulted in every error made by the student to be carefully scrutinized and teased. Bates has an annual and traditional debate with Oxford, Cambridge and Dartmouth College. It competes in the American Parliamentary Debate Association domestically, and competes in the World Universities Debating Championships, internationally. As of 2013[update], the debate council was ranked 5th, nationally and in 2012, the debate team was ranked 9th in the world. 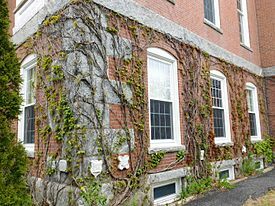 Ivy growing on the side of Hathorn Hall, featuring respective classes' Ivy stones, in celebration of the college's Ivy Day. 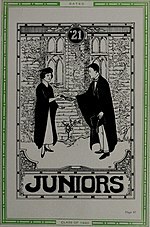 The class graduates participate in an Ivy Day which installs a granite placard onto one of the academic or residential buildings on campus. They serve as a symbol of the class and their respective history both academically and socially. 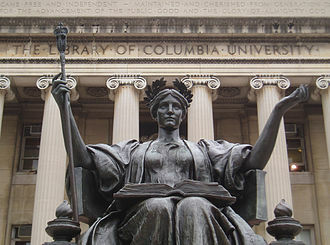 Some classes donate to the college, in the form gates, facades, and door outlines, by inscribing or creating their own version of symbolic icons of the college's seal or other prominent insignia. This usually occurs on graduation day, but may occur on later dates with alumni returning to the campus. This tradition is shared with the University of Pennsylvania and Princeton University. On Ivy Day, members of Phi Beta Kappa are announced. The laying of the Ivy, 1920. Nearly a century old, this tradition "celebrates cold and snowy weather, which is a trademark of fierce Maine winters". The college has held, on odd to even years, a Winter Carnival which comprises a themed four-day event that includes performances, dances, and games. Past Winter Carnivals have included "a Swiss Olympic skier swooshing down Mount David", faculty and student football games, faculty and administration skits, oversized snow sculptures, "serenading of the dormitories", and an expeditions to Camden. When alumnus Edmund Muskie was governor, he participated in a torch relay from Augusta to Lewiston in celebration of the 1960 Winter Olympics. 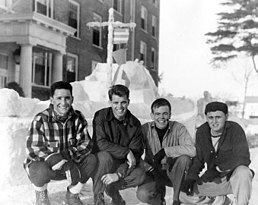 Robert F. Kennedy, with his naval classmates, built a replica of their boat back in Massachusetts out of snow in front of Smith Hall, during their carnival. This tradition is second only to Dartmouth College as the oldest of its kind in the United States. Students are known to participate in what has been colloquially termed as the 'Dartmouth Challenge', which consists of alcohol related activities, closely related to parent ritual Newman Day, a tradition the college started in the 1970s. The carnival has been hosted by the Bates Outing Club since its conception. On the Friday of Winter Carnival the Bates College Outing Club initiates the annual Puddle Jump. A hole is cut by a chainsaw or by the original axe used in the inaugural Puddle Jump of 1975, in Lake Andrews. Students from all class years jump into the hole, sometimes in costumes, to celebrate, "exuberance at the end of a hard winter." By mid-evening, they celebrate with donuts, cider and a cappella performances. The college's official mascot is the bobcat, and official color is garnet. 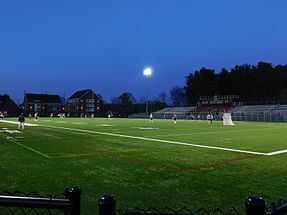 The college athletically competes in the NCAA Division III New England Small College Athletic Conference (NESCAC), which also includes Amherst, Connecticut, Hamilton, Middlebury, Trinity, Tufts, Wesleyan, Williams, and Maine rivals Bowdoin and Colby in the Colby-Bates-Bowdoin Consortium (CBB). This is one of the oldest football rivalries in the United States. This consortium is a series of historically highly competitive football games ending in the championship game between the three schools. Bates is the holder of the winning streak, and has the record for biggest victory in the athletic conference with a 51-0 shutout of Colby College. Overall the college leads the Colby-Bates-Bowdoin Consortium in wins. Bates has won this championship at total of eleven times including 2014, 2015, and in 2016 won it again with a 24–7 win over Bowdoin, after their 21–19 home victory over Colby. According to U.S. Rowing, the Women's Rowing Team is ranked 1st in the New England Small College Athletic Conference, and 1st overall in NCAA Division III Rowing, as of 2016[update]. In the 2015 season, the women's rowing team was the most decorated rowing team in collegiate racing while also being the first to sweep every major rowing competition in its athletic conference in the history of NCAA Division III athletics. In 2015, the men's rowing team had the fastest ascension in rankings of any sport in its athletic conference and is the NESCAC Rowing Champion. Bates has the 4th highest NESCAC title hold, is ranked 5th in its athletic conference and 15th in Division III athletics. As of 2018[update], the college has graduated a total of 12 Olympians, one of whom won the Olympic Gold Medal rowing for Canada at the 2008 Beijing Olympics. The all-time leader of the Chase Regatta is Bates with a total of 14 composite wins, followed by Colby's 5 wins, concluding with Bowdoin's 2 wins. The ice hockey team is the first team to win the NESCAC Club Ice Hockey Championships four times in a row. As of 2016[update], the men's club ice hockey team is ranked 5th in the Northeast, and 25th overall in the NESCHA rankings. In the winter of 2008, the college's Nordic Skiing team sent students that were was the highest ranked skiers in the Eastern Intercollegiate Ski Association and placed 4th in the 2008 NCAA Division I Championship. In April 2005, the college's athletic program was ranked top 5% of national athletics programs. The Men's Squash Team won the national championships in 2015, and 2016, with the winning student being the first in the history of the athletic conference, to be named the All American all four years he played for the college. The men's track field is the first team in the history of Maine to have seven consecutive wins of the state championship, a feat completed in 2016. Bates maintains 31 varsity teams, and 9 club teams, including sailing, cycling, ice hockey, rugby, and water polo. Bates playing a lacrosse friendly against Williams College on Garcelon Field in 2016. Bates has a wide range of tree species as a precaution against disease, and to diversify the ecosystem in their quad. In 2005, President Elaine Tuttle Hansen stated, "Bates will purchase its entire electricity supply from renewable energy sources in Maine" and secured a new contract, adding a premium of $76,000 to their energy supply. Bates College signed onto the American College and University President's Climate Commitment in 2007. In April 2008, the college completed its dining complex named "The Commons" at a cost of approximately $24 million. The complex is 60,000 square feet, certified LEED Silver, and features occupancy sensors, anti-HCFC refrigerants, natural ventilation, heat islands, and five separate dining areas with almost 70% of the walls being glass paneling. In 2009, the college was given its third $5,000 grant allocation by the Hobart Center for Foodservice Sustainability which cited Bates as "having the best sustainability program among numerous entrants nationwide". In 2010, the college was named one of 15 colleges in the United States to the "Green Honor Roll", by Princeton Review. Bates mitigates 99% of emissions via electrical consumption and purchases all of its energy from Maine Renewable Resources. The college expended $1.1 million of its endowment to install lighting retrofits, occupancy sensors, motor system replacements and energy generating mechanisms. Select buildings at the college are open 24/7, thus requiring extra energy, due to this the college has implemented technology that places buildings on "stand-by" mode while minimum occupancy is attained to preserve energy. The practice is set to reduce the college's overall emissions levels by 5 to 10 percent. Overall, the academic buildings and residential halls are equipped with day-lighting techniques, motion sensors, and efficient heating systems. Bates expended $1.5 million to implement a central plant that provides steam for heating for up to 80% of all on-campus establishments. The central plant is equipped with a modernized biomass systems and a miniature back-pressure steam turbine which reduces campus electricity consumption by 5%. The college also installed a $2.7 million 900kW hyper-roterized turbine that accounts for nearly one tenth of the campus' entire energy consumption. Bates was the first food-service operation in higher education to join the Green Restaurant Association. In 2013, the environmental practices of the college's dining services were placed along with Harvard University, and Northeastern University, as the best in the United States by the Green Restaurant Association; it earned three out of three stars, the only educational institution in Maine to do so. Bates maintains numerous environmental clubs and initiative such as Green Certification, which recognizes students who commit to sustainable policies and practices, Green Bike, which offers students access to bicycles for use on and off campus for free, and the Bates Action Energy Movement in which students participate in "both on-campus and nationwide environmental events and engage students with discussions on climate change and other pressing ecological crises." The Bates College Museum of Art, offers programs such as the Green Horizons Program that showcase environmentalism in art, society, and culture. The United States Environmental Protection Agency honored Bates as a member of the Green Power Leadership Club due to the fact 96% of energy used on campus is from renewable resources. All newly developed buildings and facilities are built to LEED Silver and Gold standards. The college is set to achieve complete carbon neutrality by 2020, as a result of campus-wide conservation efforts and specific initiatives in its implementation plan. Bates alumni have included leaders in science, religion, politics, the Peace Corps, medicine, law, education, communications, and business; and acclaimed actors, architects, artists, astronauts, engineers, human rights activists, inventors, musicians, philanthropists, and writers. As of 2015[update], there are 24,000 Bates College alumni. The college is associated, through alumni and academic staff, with the following intellectual, scientific, and social contributions to human advancement, including laying the foundations of braille typography (Frank Haven Hall), "The Kingdom" (Frank Sandford), the American civil rights movement (Benjamin Mays), basketball's fast break (Frank Keaney), the Boston Red Sox (Harry Lord, Charles Small), the fractional quantum Hall effect (Steven Girvin), and organic photochemistry (George Hammond). In national and international government, alumni of the college include the 58th U.S. Secretary of State, Edmund Muskie (1936) and U.S. Attorney General Robert F. Kennedy (1944). As of November 2018, the college has had 12 United States Congress members among its alumni: John Swasey (1859), Daniel McGillicuddy (1881), Carroll Beedy (1903), Charles Clason (1911), Donald Partridge (1914), Edmund Muskie (1936), Frank Coffin (1940), Robert F. Kennedy (1944), Leo Ryan (1944), Bob Goodlatte (1974), Ben Cline (1994), and Jared Golden (2011). In state government, Bates alumni have led all three political branches in Maine, graduating two Chief Justices of the Maine Supreme Court, two Maine Governors, and multiple leaders of both state houses. Notable military people include Brevet Major Holman Melcher (1862), as well as Medal of Honor recipients Frederick Hayes (1861), Josiah Chase (1861), Joseph F. Warren (1862), Lewis Millet (1943), Aaron Daggett (1860), and James Porter (1863). Bates alumni in business, finance, and economics include: General Mills CEO Robert Kinney (1939), Fidelity Fund managing director Barry Greenfield (1956), Merrill Lynch CFO Joseph Willit (1973), Japonica Partners CEO Paul Kazarian (1978), L Catterton CEO Michael Chu (1980), Cubist Pharmaceuticals CEO Michael Bonney (1980), National Bank of Canada CEO Louis Vachon (1983), and Affiliated Managers Group CFO Darrell Crate (1989). In literature, journalism, television, and film, the following attended Bates: actors Jeffery Lynn (1930), John Shea (1970), Maria Bamford (1990–92), Bryant Gumbel (1970) as well as writers Elizabeth Strout (1977), Lisa Genova (1992), and Brian McGrory (1984). Bates counts 12 Olympian alumni: Vaughn Blanchard (1912), Harlan Holden (1913), Ray Buker (1922), Art Sager (1926), Arnold Adams (1933), Nancy Fiddler (1978), Mike Ferry (1997), Justin Freeman (1998), Andrew Byrnes (2005), Hayley Johnson (2006), Emily Bamford (2015), and Dinos Lefkaritis (2019). The central administration of Bates, Lane Hall. 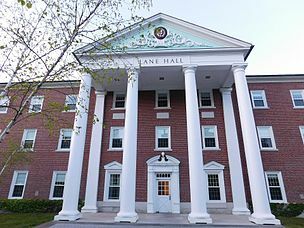 Bates College is governed by its central administration, headquartered in and metonymically known as "Lane Hall". The first president of the college was its founder, Oren Burbank Cheney and its president is Clayton Spencer, who took office October 26, 2012. There have been eight presidents of Bates College, and one interim president. The president is ex officio a member and president of the Board of Trustees, chief executive officer of the corporation, and principal academic of the college. There are 37 members on the Bates College Board of Trustees. The Chairman of the Board is 1980 alumnus and former CEO of Cubist Pharmaceuticals, Michael Bonney. Bates College is a tax-exempt organization that complies with section 501(c) of the U.S. Internal Revenue Code. According to NACUBO's "U.S. and Canadian Institutions Endowment Value Listing", the Bates College Endowment Fund has a mark-to-market value of $293.8 million as of 2017[update] fiscal year. According to PwC, the net equity of Bates College is about $390 million as of 2015[update]. As of the 2016 fiscal year, the college received $28.2 million in overall donations demonstrating a 134% increase in giving since 2013, and breaking the previous 2006 record of $24.8 million. In May 2017, Clayton Spencer announced the "Bates+You" fundraising campaign–the largest ever undertaken by the college–due to close out on $300 million. Although the college's endowment has seen increased growth and market value, it is considered high in its market but low among its peers; this increases the college's fee dependency and overall sticker price, which at one point was the most expensive in the country. During the 2007–08 financial crisis and subsequent recession, the college's endowment lost 31% of market value. Were we to guarantee a fossil fuel free endowment more broadly than the 200 companies, greater than half of the endowment would need to be liquidated. In either scenario, the transition would result in significant transaction costs, a long-term decrease in the endowment's performance, an increase in the endowment's risk profile, and thus a loss in annual operating income for the college. Throughout its history, the College has been notably featured in literature, artistic works and overall popular culture. The Letter (2003): Selected portions of the movie were filmed on or directly on the side of the college's campus. Lady Dynamite (2016–18): The Netflix original series is loosely based on the life of Bates alumna Maria Bamford. Bamford plays a fictionalized version of herself whose character also attended Bates. On April 20, 1987, actor Paul Newman wrote to President Reynolds to register his disapproval of one of the student's traditions called Newman Day. The incident received widespread media coverage due to Newman's public disappointment with the tradition and the response of the college. On July 17, 2006, Sports Illustrated profiled a tradition conceived by the students of Bates in an article entitled, "With This Ring, I Bust Thy Chops." Bates has been subject to widespread media attention as one of the most expensive colleges in the United States and in June 2011, was named the most expensive in the United States. ^ There is a discrepancy with the founding of the college. Only Muskie and Kennedy have served in the United States Senate, representing Maine and New York, respectively. Kennedy and Ryan attended Bates for their V-12 Naval Program and received specialized degrees in 1944. ^ a b As of June 30, 2017[update]. "U.S. and Canadian Institutions Listed by Fiscal Year (FY) 2017 Endowment Market Value and Change in Endowment Market Value from FY 2016 to FY 2017" (PDF). National Association of College and University Business Officers and Commonfund Institute. 2018. Archived from the original (PDF) on March 6, 2018. Retrieved August 11, 2018. ^ Federle, Patrick (August 2, 2017). "Top 25 Liberal Arts Colleges 2017". Forbes. Retrieved June 1, 2018. ^ "Bates graduate awarded Fulbright grant". Merit Pages. Retrieved June 1, 2018. ^ "Watson Fellowship – Bates College". www.bates.edu. Retrieved June 1, 2018. ^ "Rhodes Institution Winners: Bates College" (PDF). Retrieved June 1, 2018. ^ a b Burns, Jay (November 11, 2018). "Ben Cline '94 wins U.S. House seat; Jared Golden '11 awaits historic decision". Bates Magazine. Retrieved November 14, 2018. ^ "July 1943: The Navy arrives | 150 Years". Bates College. Retrieved August 14, 2017. ^ a b c Thomas Evans (2002). Robert F. Kennedy: His Life. Ladd Library, Bates College, Lewiston, Maine: Simon & Schuster; Reprint edition. p. 35. 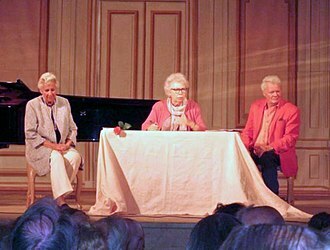 ^ Thomas Stuan (2006). The Architecture of Bates College. Ladd Library, Bates College, Lewiston, Maine: Bates College. p. 19. ^ "Pulitzer Prize Winners". www.pulitzer.org. Archived from the original on January 8, 2016. Retrieved June 1, 2018. ^ a b c d e f g h Cheney, Emeline. "The story of the life and work of Oren B. Cheney, founder and first president of Bates college". archive.org. Retrieved August 11, 2018. ^ "Bates College". Forbes. Retrieved 2016-06-16. [Bates College] was the first coeducational college in New England. ^ "Chapter 3 | 150 Years | Bates College". www.bates.edu. Retrieved August 11, 2018. ^ Johnnett, R. F. (1878). Bates Student: A Monthly Magazine. Edmund Muskie Archives, Bates College, Lewiston, Maine: Bates College. pp. Multi–source, pp. 2. ^ "Oren B. Cheney | 150 Years | Bates College". www.bates.edu. Retrieved August 11, 2018. ^ "Mary W. Mitchell | 150 Years | Bates College". www.bates.edu. Retrieved August 11, 2018. ^ Calhoun, Charles C (1993). A Small College in Maine. Hubbard Hall, Bowdoin College: Bowdoin College. p. 163. ^ Eaton, Mabel (1930). General Catalogue of Bates College and Cobb Divinity School. Coram Library, Bates College, Lewiston, Maine. : Bates College. pp. 34, 36, 42. ^ "Chapter 4 | 150 Years | Bates College". www.bates.edu. Retrieved August 11, 2018. ^ a b Woz, Markus (2002). Traditionally Unconventional. Ladd Library, Bates College, Lewiston, Maine: Bates College. p. 6. ^ a b "Chapter 4 | 150 Years | Bates College". www.bates.edu. Retrieved August 11, 2018. ^ "Brand Identity Guide | Communications | Bates College". www.bates.edu. Retrieved August 11, 2018. ^ "Chapter 1 | 150 Years | Bates College". www.bates.edu. Retrieved August 11, 2018. ^ Morgan, James. "Who Saves Little Round Top?". Retrieved August 11, 2018. Number four: Col. Chamberlain did not lead the charge. Lt. Holman Melcher was the first officer down the slope. ^ "Henry Chandler | 150 Years | Bates College". www.bates.edu. Retrieved August 11, 2018. 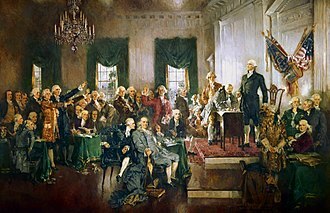 ^ "Progressive men of the state of Montana". archive.org. p. 472. Retrieved August 11, 2018. ^ "George C. Chase | 150 Years | Bates College". www.bates.edu. Retrieved August 11, 2018. ^ a b "A Brief History | 150 Years | Bates College". www.bates.edu. Retrieved August 11, 2018. ^ a b "Harry Lord | Society for American Baseball Research". sabr.org. Retrieved August 11, 2018. ^ "Student Clubs and Organizations | Campus Life | Bates College". www.bates.edu. Archived from the original on November 23, 2015. Retrieved August 11, 2018. ^ "January 1920: The Outing Club's winter birth | 150 Years | Bates College". www.bates.edu. Retrieved August 11, 2018. ^ a b c d e Clark, Charles E. (2005). Bates Through the Years: an Illustrated History. Edmund Muskie Archives: Bates College, Lewiston, Maine. p. 37. ^ "Bates debates Harvard at City Hall | 150 Years | Bates College". www.bates.edu. Retrieved August 11, 2018. ^ "Oxford and Bates to Meet in Debate". Google News Archives. Lewiston Daily Sun. August 23, 1923. p. 14. Retrieved August 11, 2018. ^ "Victory Ships built by the United States Maritime Commission during World War II". www.usmm.org. Retrieved August 11, 2018. ^ "July 1943: The Navy arrives | 150 Years | Bates College". www.bates.edu. Retrieved August 11, 2018. ^ Walter Isaacson (October 17, 2011). Profiles in Leadership: Historians on the Elusive Quality of Greatness. Simon & Schuster. ISBN 9780393340761. ^ Larson, Timothy (2005). Faith by Their Works: The Progressive Tradition at Bates College from 1855 to 1877. Edmund S. Muskie Archives and Special Collections, Bates College, Lewiston, Maine: Bates College Publishing. pp. Multi–source. ^ Burns, Jay (June 13, 2016). "Is the student-led Mount David cleanup a model for a litter-free hill?". www.bates.edu. Retrieved August 11, 2018. ^ Woz, Markus (2002). Traditionally Unconventional. Ladd Library, Bates College, Lewiston, Maine: Bates College. p. 6. ^ Araton, Harvey (November 15, 2013). "The Night the Ali-Liston Fight Came to Lewiston". The New York Times. ISSN 0362-4331. Retrieved August 11, 2018. ^ "Bowdoin Football Opens CBB Chase Saturday at Bates – Bowdoin". athletics.bowdoin.edu. November 5, 2015. Retrieved August 11, 2018. 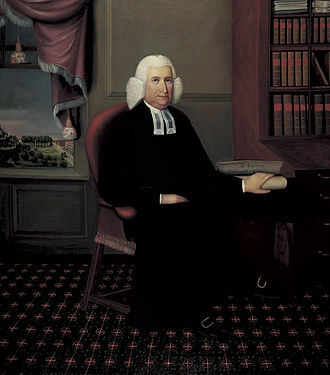 ^ "Thomas Hedley Reynolds | 150 Years | Bates College". www.bates.edu. Retrieved August 11, 2018. ^ "Optional Testing at Bates College". www.bates.edu. Retrieved August 11, 2018. ^ "Donald West Harward | Past Presidents | Bates College". www.bates.edu. Retrieved August 11, 2018. ^ "Donald W. Harward | 150 Years | Bates College". www.bates.edu. Retrieved August 11, 2018. ^ a b c Furlow, Matt (May 1, 2013). "Diversity of what?". www.thebatesstudent.com. Retrieved August 11, 2018. ^ a b c Pham, Michelle (April 30, 2014). "Real talk". www.thebatesstudent.com. Retrieved August 11, 2018. ^ Tatro, Devin (January 15, 2014). "Debunking the "Middle Class myth" | The Bates Student". www.thebatesstudent.com. Retrieved August 11, 2018. ^ "Bates College Students Protest Lack of Minorities". The Chronicle of Higher Education. April 13, 1994. Retrieved August 11, 2018. ^ Shawker, Cheri (2016). "White Priviliage at Bates College". Bates College. Retrieved August 11, 2018. ^ "Elaine Tuttle Hansen | Past Presidents | Bates College". www.bates.edu. Retrieved August 11, 2018. ^ "Hansen inaugurated as Bates' seventh president". www.bates.edu. Retrieved August 11, 2018. ^ a b "The 50 most expensive U.S. colleges". www.cbsnews.com. Retrieved August 11, 2018. ^ Staley, Oliver (June 30, 2011). "Bates Charging $51,300 Leads Expensive U.S. Colleges List". Bloomberg.com. Retrieved August 11, 2018. ^ "Academic Access, Education Reform". Harvard Magazine. October 29, 2012. Retrieved August 11, 2018. ^ "Questions Worth Asking — President Clayton Spencer's inaugural address". www.bates.edu. Retrieved August 11, 2018. ^ "Some Colleges Have More Students From the Top 1 Percent Than the Bottom 60. Find Yours". The New York Times. January 18, 2017. ISSN 0362-4331. Retrieved August 11, 2018. ^ Thompson, Derek. "How Much Income Puts You in the 1 Percent if You're 30, 40, or 50?". The Atlantic. Retrieved August 11, 2018. ^ Cox, Gregor Aisch, Larry Buchanan, Amanda; Quealy, Kevin (January 18, 2018). "Economic diversity and student outcomes at Bates". The New York Times. ISSN 0362-4331. Retrieved August 11, 2018. ^ "Bates announces $10 million gift from Elizabeth Kalperis Chu '80 and Michael Chu '80 to name new residence halls". October 28, 2016. Retrieved August 11, 2018. ^ "Digital and Computational Studies | Bates College". www.bates.edu. Retrieved August 11, 2018. ^ Writer, Noel K. GallagherStaff (May 16, 2017). "Maine family gives $50 million 'transformational' gift to Bates College capital campaign – Portland Press Herald". Press Herald. Retrieved August 11, 2018. ^ "Academics | Bates College". www.bates.edu. Retrieved August 11, 2018. ^ a b "Short Term | Academics | Bates College". www.bates.edu. Retrieved August 11, 2018. ^ a b c d e "Bates College 2014/2015 Statistics and Facts" (PDF). Bates College. Archived from the original (PDF) on 2015-05-31. Retrieved August 11, 2018. ^ "Engineering | Career Development Center | Bates College". www.bates.edu. Retrieved August 11, 2018. ^ a b "Educating the Whole Person | Academics | Bates College". www.bates.edu. Retrieved August 11, 2018. ^ "Honors Program – Bates College". www.bates.edu. Retrieved August 11, 2018. ^ "Honors Guidelines – Honors Program – Bates College". www.bates.edu. Retrieved August 11, 2018. ^ "NSF – NCSES Academic Institution Profiles – Bates College : Federal obligations for science and engineering, by agency and type of activity: 2014". ncsesdata.nsf.gov. Archived from the original on 2018-08-13. Retrieved August 11, 2018. ^ "NCSES Data Set: Bates College". Archived from the original on 2017-01-13. Retrieved August 11, 2018. ^ "Bates Student Research Fund | Academics | Bates College". www.bates.edu. Retrieved August 11, 2018. ^ "STEM Travel Grants | Academics | Bates College". www.bates.edu. Retrieved August 11, 2018. ^ "Barlow Grants | Off-Campus Study | Bates College". www.bates.edu. Retrieved August 11, 2018. ^ "Research Opportunities | Academics | Bates College". www.bates.edu. Retrieved August 11, 2018. ^ "Grant News | External Grants | Bates College". www.bates.edu. Retrieved August 11, 2018. ^ "Community-Engaged Research | Harward Center | Bates College". www.bates.edu. Retrieved August 11, 2018. ^ "Economics department ranked at top of leading liberal arts college". October 25, 2001. Retrieved August 11, 2018. ^ "Faculty | Economics | Bates College". www.bates.edu. Retrieved August 11, 2018. ^ "The Faculty Handbook of Bates College: Faculty Benefits and Support Programs". abacus.bates.edu. Retrieved August 11, 2018. 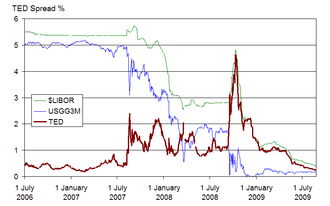 ^ Weiss, Richard G.; Wamser, Carl C. (2006). "Introduction to the Special Issue in honour of George Simms Hammond". Photochemical & Photobiological Sciences. 5 (10): 869–870. doi:10.1039/b612175f. ^ Wamser, Carl C. (May 5, 2003). "Biography of George S. Hammond". The Journal of Physical Chemistry A. 107 (18): 3149–3150. Bibcode:2003JPCA..107.3149W. doi:10.1021/jp030184e. ISSN 1089-5639. ^ "Steven Girvin | Chair-Elect, Nominating Committee". American Physical Society. Archived from the original on 9 July 2009. Retrieved 11 August 2018. ^ Smith, D. Ray. "John Googin: The scientist of Y-12". Retrieved August 11, 2018. ^ "Frances M. Carroll". Atomic Heritage Foundation. Retrieved August 11, 2018. ^ "Stephens Observatory | Physics & Astronomy | Bates College". www.bates.edu. Retrieved August 11, 2018. ^ "The Ladd Planetarium | Physics & Astronomy | Bates College". www.bates.edu. Retrieved August 11, 2018. ^ Stuan, Thomas (2006). Architecture of Bates College. Ladd Library, Bates College, Lewiston, Maine: Bates College, Lewiston, Maine. p. 23. ^ a b c Fischer, Kent (April 3, 2015). "Students admitted to the Class of 2019 are the academically strongest, most diverse in Bates history". www.bates.edu. Retrieved August 11, 2018. ^ "Executive Compensation at Private and Public Colleges". The Chronicle of Higher Education. December 6, 2015. Archived from the original on 2015-12-07. Retrieved August 11, 2018. ^ "Mount David Summit – Bates College". www.bates.edu. Retrieved August 11, 2018. ^ "Bates College hosting 15th Mount David Summit". Sun Journal. Retrieved August 11, 2018. ^ "At age 12, Mount David Summit is better than ever – Bates College". www.bates.edu. Retrieved August 11, 2018. ^ a b "Student Profile | Admission | Bates College". www.bates.edu. Retrieved August 11, 2018. ^ "Bates College Common Data Set 2017" (PDF). Archived from the original (PDF) on 2017-10-07. Retrieved August 11, 2018. ^ a b c "Bates College Common Data Set" (PDF). Retrieved August 11, 2018. ^ "Bates College | Applying | Best College | US News". colleges.usnews.rankingsandreviews.com. Archived from the original on 2011-02-16. Retrieved August 11, 2018. ^ a b "Bates College Admissions, Average Test Scores & Tuition The Princeton Review". Princeton Review. Retrieved August 11, 2018. ^ "Bates College Common Data Set 2008-09" (PDF). Retrieved July 22, 2018. ^ "Optional Testing | Admission | Bates College". www.bates.edu. Retrieved August 11, 2018. ^ "20-year Bates College study of optional SATs finds no differences | News | Bates College". www.bates.edu. October 1, 2005. Retrieved August 11, 2018. ^ "Tuition & Fees | Student Financial Services | Bates College". www.bates.edu. Retrieved August 11, 2018. ^ "List of Colleges That Meet 100% of Financial Need | The College Solution". www.thecollegesolution.com. Retrieved August 11, 2018. ^ "Federal Financial Aid Programs" (PDF). Archived from the original (PDF) on 2015-05-31. Retrieved August 11, 2018. ^ "Bates College: Admissions, Average Test Scores & Tuition : The Princeton Review". Princeton Review. Retrieved August 11, 2018. ^ Smith, Kate (December 22, 2016). "Little Good News for the Little Ivies". www.bloomberg.com. Retrieved August 11, 2018. ^ "Liberal Arts College Rankings 2013 | Washington Monthly". 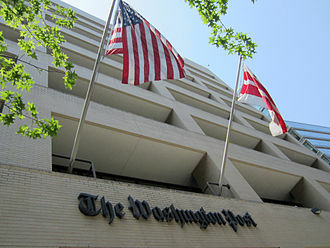 www.washingtonmonthly.com. Archived from the original on June 25, 2014. Retrieved August 11, 2018. ^ "Bates College – The Princeton Review College Rankings & Reviews". www.princetonreview.com. Retrieved August 11, 2018. ^ Schifrin, Matt. "Private College Financial Health Grades 2015: Is Your Alma Mater At Risk?". Forbes. Retrieved August 11, 2018. ^ "Bates College". Niche.com. Retrieved August 11, 2018. ^ "Top Producers of Fulbright U.S. Scholars and Students, 2017-18". The Chronicle of Higher Education. November 18, 2018. Retrieved August 11, 2018. ^ a b Martin, Emmie (September 1, 2015). "The 48 best colleges in the Northeast". poconorecord.com. Retrieved August 11, 2018. ^ "Alumni Factor Rankings; Bates College". Retrieved August 11, 2018. ^ "Best Universities and Colleges | Payscale". www.payscale.com. Retrieved August 11, 2018. ^ a b "Bates College". Niche. Retrieved August 11, 2018. ^ "Bates College". Niche, Inc. Retrieved August 11, 2018. ^ "Top 227 Schools | The Alumni Factor". www.alumnifactor.com. Retrieved August 11, 2018. ^ "Top Producers of U.S. Fulbright Scholars and Students". The Chronicle of Higher Education. Archived from the original on 2016-02-22. Retrieved August 11, 2018. ^ "Bates College ranks No. 1 in Fulbright Student awards for 2017–18". February 19, 2018. Retrieved August 11, 2018. ^ a b "Bates recognized for top academic experience". www.bates.edu. August 20, 2003. Retrieved August 11, 2018. ^ "Bates ranked No. 1 'Best Value' by Princeton Review | News | Bates College". www.bates.edu. April 18, 2005. Retrieved August 11, 2018. ^ "Wall Street Journal cites Bates for 'elite' grad-school preparation". www.bates.edu. October 2, 2003. Retrieved August 11, 2018. ^ "Who Does Your College Think Its Peers Are?". The Chronicle of Higher Education. Archived from the original on 2015-10-11. Retrieved August 11, 2018. ^ Hubley, Doug. "Bates in the News Bates Magazine Bates College". www.bates.edu. Retrieved August 11, 2018. ^ Anderson, Nick (October 20, 2016). "Here's a new college ranking, based entirely on other college rankings". Washington Post. Retrieved June 1, 2018. ^ a b Lobosco, Katie (September 20, 2016). "Colleges with the highest paid grads". CNNMoney. Retrieved August 11, 2018. ^ Burns, Jay (January 8, 2016). "Two alumni among the year's "brightest young entrepreneurs, breakout talents, and change agents"". www.bates.edu. Retrieved August 11, 2018. ^ Burns, Jay (May 22, 2015). "50 years ago: Ali, Liston, Lewiston, Bates". www.bates.edu. Retrieved August 11, 2018. ^ a b Stuan, Thomas (2006). Architecture of Bates College. Ladd Library, Bates College, Lewiston, Maine: Bates College, Lewiston, Maine. p. 23. ^ Stuan, Thomas (2006). The Architecture of Bates College. Ladd Library, Bates College, Lewiston, Maine: Bates College. p. 23. ^ "The Peter J. Gomes Chapel | Multifaith Chaplaincy | Bates College". www.bates.edu. Retrieved August 11, 2018. ^ a b "Bates-Morse Mountain & Shortridge | Harward Center | Bates College". www.bates.edu. Retrieved August 11, 2018. ^ a b "Bates-Morse Mountain Conservation Area and Shortridge Field Research | Harward Center | Bates College". www.bates.edu. Retrieved August 11, 2018. 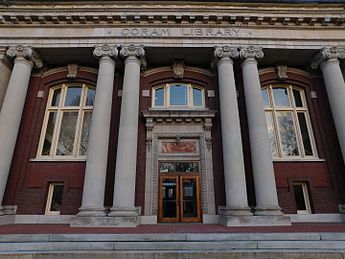 ^ "Coram Library | Library | Bates College". www.bates.edu. Retrieved August 11, 2018. ^ "Library | Bates College". www.bates.edu. Retrieved August 11, 2018. ^ "Bates College: Muskie Archives: Collections". abacus.bates.edu. Retrieved August 11, 2018. ^ "Campus Facilities Planning – Bates College". www.bates.edu. Retrieved August 11, 2018. ^ "Lane Hall | Campus Tour | Bates College". www.bates.edu. Archived from the original on 2016-06-16. Retrieved August 11, 2018. ^ "Olin Arts Center | Music | Bates College". www.bates.edu. Retrieved August 11, 2018. ^ "Olin Arts Center | Campus Tour | Bates College". www.bates.edu. Archived from the original on 2017-09-05. Retrieved August 11, 2018. ^ Burns, Jay (January 31, 2014). "Three days, three big Bates concerts: songs of Hanns Eisler, Glazer's 99th, singer McCalla | News | Bates College". www.bates.edu. Retrieved August 11, 2018. ^ "Taking a break from the Carolina Chocolate Drops, singer McCalla to perform | News | Bates College". www.bates.edu. January 31, 2014. Retrieved August 11, 2018. ^ Burns, Jay (March 27, 2007). "College joins Maine Music Society to amass 260 musicians for Brahms concert | News | Bates College". www.bates.edu. Retrieved August 11, 2018. ^ Clark, Charles E. (2005). Bates Through the Years: an Illustrated History. Edmund Muskie Archives: Bates College, Lewiston, Maine: Edmund Muskie Archives. p. 37. ^ "The Painter of Maine: Photographs of Marsden Hartley | Museum of Art | Bates College". www.bates.edu. Retrieved August 11, 2018. ^ "Marsden Hartley and Beyond | Museum of Art | Bates College". www.bates.edu. Retrieved August 11, 2018. 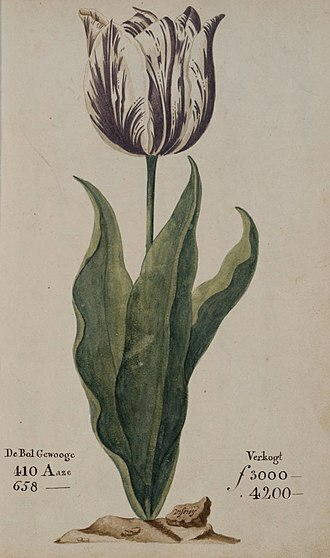 ^ "History of the Museum of Art | Museum of Art | Bates College". www.bates.edu. Retrieved August 11, 2018. ^ "ShortRdige Programs: Bates College" (PDF). Retrieved August 11, 2018. ^ Ashraf, Syjil (September 29, 2017). "75 Best Colleges for Food in America for 2015". The Daily Meal. Retrieved August 11, 2018. ^ "Survey ranks the colleges with the best food plans". USA TODAY College. January 12, 2015. Archived from the original on 2015-01-13. Retrieved August 11, 2018. ^ "Bates College – Campus Food". Niche.com. Retrieved August 11, 2018. ^ "Food Quality and Nutrition | Dining Services | Bates College". www.bates.edu. Retrieved August 11, 2018. ^ "The Den | Campus Tour | Bates College". www.bates.edu. Archived from the original on 2012-04-28. Retrieved August 11, 2018. ^ "Bates Emergency Medical Services, Bates College". abacus.bates.edu. Retrieved August 11, 2018. ^ "Security & Campus Safety | Bates College". www.bates.edu. Retrieved August 11, 2018. ^ "Fare to remember: Harvest Meal 2008 | News | Bates College". www.bates.edu. November 13, 2008. Retrieved August 11, 2018. ^ "Fall 2015 Concert: T-Pain | Campus Life | Bates College". www.bates.edu. Archived from the original on 2016-12-12. Retrieved August 11, 2018. ^ "Martin Luther King Jr. Observance | Bates College". www.bates.edu. Retrieved August 11, 2018. ^ "MLK Day 2016 keynote speaker: William Jelani Cobb | Martin Luther King Jr. Observance | Bates College". www.bates.edu. Retrieved August 11, 2018. ^ a b "Student Clubs and Organizations | Campus Life | Bates College". www.bates.edu. Archived from the original on 2015-09-04. Retrieved August 11, 2018. ^ "Bates Outing Club | Bates College". www.bates.edu. Retrieved August 11, 2018. ^ "Pulitzer goes to Elizabeth Strout, former L.A. Times book award winner". LA Times Blogs – Jacket Copy. December 20, 2009. Retrieved August 11, 2018. ^ Messud, Claire (March 1, 2016). "Elizabeth Strout's 'My Name Is Lucy Barton'". The New York Times. ISSN 0362-4331. Retrieved August 11, 2018. ^ Thomas, Hilary (January 5, 2016). 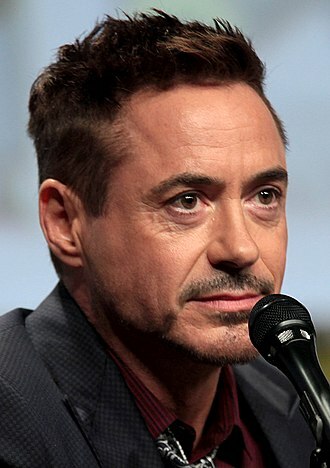 "Producers nominate 'Max,' 'Short,' leave off 'Star Wars'". CNN. Retrieved August 11, 2018. ^ "The Bates Student | Voice of Bates College since 1873". www.thebatesstudent.com. Retrieved August 11, 2018. ^ "Best College Radio Station | The Princeton Review". www.princetonreview.com. Retrieved August 11, 2018. ^ "Student Groups | Music | Bates College". www.bates.edu. Archived from the original on 2015-09-26. Retrieved August 11, 2018. ^ "Brooks Quimby Debate Council | Bates College". www.bates.edu. Retrieved August 11, 2018. ^ Burns, John F. (November 27, 2007). "Oxford Union girds for far-right debate Protesters vow 'anti- fascist' rally". International Herald Tribune: 1. ^ Clark, Charles E. (2005). Bates Through the Years: an Illustrated History. Edmund Muskie Archives: Bates College, Lewiston, Maine. p. 37. Oxford's Union has been historical characterized as the playground of the powerful, but with the mounting power the alumni of Brooks have accumulated it is clear to see the society is the playground of the powerful in the states. ^ VanDerburgh, Barbara (October 31, 2013). "Bates debate ranks fifth in nation, including key win at Yale Inter-Varsity Tournament". www.bates.edu. Retrieved August 11, 2018. ^ Burns, Jay (February 29, 2012). "Bates debate hits No. 9 in global ranking". www.bates.edu. Retrieved October 31, 2013. ^ "The Class of 1975 joins the ivy stone tradition | News | Bates College". www.bates.edu. Retrieved August 11, 2018. ^ a b "January 1958: The Winter Carnival torch tradition". www.bates.edu. Retrieved August 11, 2018. 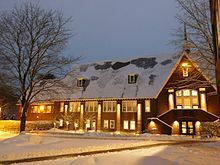 ^ "Winter carnival to be held | News | Bates College". www.bates.edu. January 13, 1997. Retrieved August 11, 2018. ^ Popik, Barry (July 6, 2012). ""24 hours in a day, 24 beers in a case. Coincidence? I think not." (Newman Day)". www.barrypopik.com. Retrieved August 11, 2018. ^ Goldberg, Hannah (January 21, 2015). "95th anniversary of Winter Carnival". Retrieved August 11, 2018. ^ "Puddle Jump | 150 Years | Bates College". www.bates.edu. August 11, 2018. Retrieved August 11, 2018. ^ "2016-17 Football Schedule | Athletics | Bates College". athletics.bates.edu. Retrieved August 11, 2018. ^ Karsten, James (November 11, 2015). "Football secures second consecutive CBB championship with win over Bowdoin – The Bates Student". The Bates Student. Retrieved August 11, 2018. ^ "California Takes the Top – Barry and Bates Hold in USRowing/CRCA Week Five Poll". www.usrowing.org. Archived from the original on 2016-04-28. Retrieved August 11, 2018. ^ "Bates Men, Women Sweep NESCAC Rowing Championships – NESCAC". www.nescac.com. May 10, 2015. Retrieved August 11, 2018. ^ "Bobcat Olympians | Athletics | Bates College". athletics.bates.edu. Retrieved August 11, 2018. ^ "Women's rowing team dominates the New England Rowing Championships | Athletics | Bates College". athletics.bates.edu. May 2, 2015. Retrieved August 11, 2018. ^ "League Standings Northeast Collegiate Hockey Association (NECHA) – Pointstreak Sites". pointstreaksites.com. May 1, 2016. Retrieved August 11, 2018. 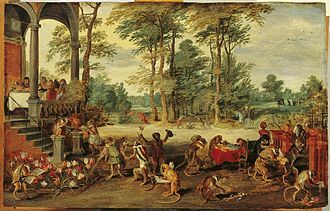 ^ "EISA Skiing". Archived from the original on March 14, 2016. Retrieved August 11, 2018. ^ "Bates ranked in top 5 percent of national athletics programs News Bates College". www.bates.edu. April 14, 2005. Retrieved August 11, 2018. ^ Morse, Aaron (March 24, 2016). "Shot by shot, an inside look at Bates squash champ Ahmed Abdel Khalek's road to victory". www.bates.edu. Retrieved August 11, 2018. ^ "Bates wins seventh straight Maine State Men's Outdoor Championship | Athletics | Bates College". athletics.bates.edu. April 23, 2016. Retrieved August 11, 2018. ^ "Athletics | Bates College". athletics.bates.edu. Retrieved August 11, 2018. ^ "Bates commits to Maine 'green power' for its electricity". www.bates.edu. November 22, 2005. Retrieved August 11, 2018. ^ "President's Climate Commitment" (PDF). Archived from the original (PDF) on December 8, 2015. Retrieved December 4, 2015. ^ Elbaum, Meredith (May 1, 2005). "A Not So Common College Commons: Sustainable Dining at Bates College". Journal of Green Building. 5 (2): 16–26. doi:10.3992/jgb.5.2.16. ISSN 1552-6100. ^ Burns, Jay (January 1, 2015). "Lucky Seven: Bates Dining Commons – PUPN Mag". www.pupnmag.com. Retrieved August 11, 2018. ^ "Dining Commons | Sustainability | Bates College". www.bates.edu. Retrieved August 11, 2018. ^ "Traulsen". www.traulsen.com. Retrieved August 11, 2018. ^ "Princeton Review Chooses The Evergreen State College for Its "Green Rating Honor Roll" at Evergreen". www.evergreen.edu. July 28, 2010. Retrieved August 11, 2018. ^ a b c d e "Bates College Sustainability" (PDF). January 1, 2013. Retrieved August 11, 2018. ^ Yale Kamila, Avery (October 21, 2015). "Mystery meat yields to greener meals in Maine college dining halls". Press Herald. Retrieved August 11, 2018. ^ Hubley, Doug (July 31, 2013). "Bates earns third star for 'green' dining, joining just five other schools in category". www.bates.edu. Retrieved August 11, 2018. ^ "Green Certification | Sustainability | Bates College". www.bates.edu. Retrieved August 11, 2018. ^ "Green Bike Program | Sustainability | Bates College". www.bates.edu. Retrieved August 11, 2018. ^ "Sustainability at Bates College". www.bates.edu. Retrieved August 11, 2018. ^ "Green Horizons | Museum of Art | Bates College". www.bates.edu. Retrieved August 11, 2018. ^ "Scribd". www.scribd.com. Archived from the original on 2016-01-05. Retrieved August 11, 2018. ^ "Bates College – Green Report Card 2011". www.greenreportcard.org. May 4, 2011. Retrieved August 11, 2018. ^ Association, Illinois Education (August 11, 2018). Annual Meeting. ^ I., P. (January 1, 1976). "Frank Haven Hall (1843–1911) A Biographical Sketch". Journal of Special Education. 10 (2): 120. doi:10.1177/002246697601000201. ISSN 0022-4669. Archived from the original on 2018-08-13. Retrieved 2018-12-14. ^ Shirley Nelson. "The Story of Shiloh". Retrieved August 14, 2017. ^ "Benjamin E. Mays | 150 Years | Bates College". www.bates.edu. Retrieved August 11, 2018. ^ James Karsten (October 8, 2014). "Top 10 Bates Athletes: #7 Frank Keaney '11". The Bates Student. Bates College. Retrieved August 14, 2017. ^ Anslyn, Eric V.; Dougherty, Dennis A. (2006). 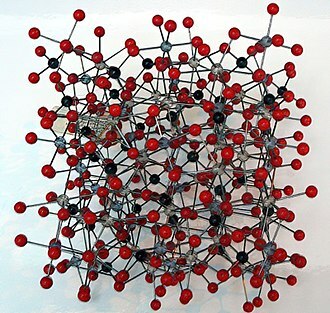 Modern Physical Organic Chemistry. Sausalito, California: University Science. ^ "Chapter 2 | 150 Years | Bates College". www.bates.edu. Retrieved August 11, 2018. ^ ARNEWS, 25th ID and. "Hero who led last major U.S. bayonet charge dies | Article | The United States Army". www.army.mil. Archived from the original on 2015-01-25. Retrieved August 11, 2018. ^ Ellis, William Arba (1911). Norwich University, 1819-1911: Her History, Her Graduates, Her Roll of Honor. Capital City Press. ^ "Robert Kinney '39 awarded Mays Medal at Benjamin Bates Society meeting". Bates College. December 2, 2008. Retrieved August 14, 2017. ^ "Stay in the Game | Bates Magazine | Bates College". www.bates.edu. July 17, 2004. Retrieved August 11, 2018. ^ "Joseph T. Willett '73". Bates College. 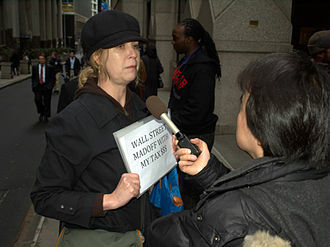 April 7, 2007. Archived from the original on April 7, 2007. Retrieved May 25, 2016. ^ "Paul B. Kazarian: Executive Profile & Biography – Businessweek". www.bloomberg.com. Retrieved August 11, 2018. ^ "J. Michael Chu: Executive Profile & Biography". Businessweek. Bloomberg L.P. Retrieved August 14, 2017. ^ "Bates board chair Bonney '80 named a top U.S. CEO by MarketWatch". Bates College. January 19, 2012. Retrieved August 14, 2017. ^ "CEO of the Year 2014: Louis Vachon of National Bank". Canadian Business – Your Source For Business News. November 5, 2011. Archived from the original on 2014-11-11. Retrieved August 11, 2018. ^ "$11.5 million Catalyst Fund will support 'transformational change' at Bates College". Bates College. October 28, 2013. Retrieved August 14, 2017. ^ "Stages of Shea | Bates Magazine | Bates College". www.bates.edu. Retrieved August 11, 2018. ^ Sara Corbett (July 17, 2014). "The Weird, Scary and Ingenious Brain of Maria Bamford". The New York Times. ISSN 0362-4331. Retrieved August 14, 2017. ^ Rick Reilly (August 26, 2014). "The Mourning Anchor: Bryant Gumbel is alone at the top with the memory of his late father". Sports Illustrated. Retrieved August 14, 2017. ^ Carrie Tuhy (December 4, 2015). "Pulitzer-Winner Elizabeth Strout Takes on the Mother-Daughter Bond". Publishers Weekly. Retrieved August 14, 2017. ^ "Genova '92, best-selling author of 'Still Alice,' 'Left Neglected,' to speak". www.bates.edu. Retrieved August 11, 2018. ^ Jay Burns (February 25, 2013). "Media describe arc of newspaperman Brian McGrory '84, new Boston Globe editor". Bates College. Retrieved August 14, 2017. ^ "'Questions Worth Asking' — President Clayton Spencer's inaugural address | News | Bates College". www.bates.edu. Retrieved 2015-12-23. ^ "Past Presidents – Bates College". www.bates.edu. Retrieved August 11, 2018. ^ "Laws of the President and Trustees of Bates College" (PDF). Retrieved August 11, 2018. ^ "Bates College Audited Statements" (PDF). Retrieved August 11, 2018. ^ Pricewatercooper. "Bates College Financial Statements – June 30, 2015 and 2014" (PDF). Retrieved August 11, 2018. ^ "Historic $300 million Bates Campaign aims to 'secure what is best and most distinctive about Bates and to shape new strategies for a new age'". www.bates.edu. May 16, 2017. Retrieved August 11, 2018. ^ Gallagher, Noel K. (May 16, 2017). "Maine family gives $50 million 'transformational' gift to Bates College capital campaign – Portland Press Herald". Press Herald. Retrieved August 11, 2018. ^ a b Staley, Oliver (June 30, 2011). "Bates Charging $51,300 Leads Expensive U.S. Colleges List". Bloomberg.com. Retrieved August 11, 2018. ^ Sgarro, Katharine (March 6, 2013). "The truth about Bates' endowment". www.thebatesstudent.com. Retrieved August 11, 2018. ^ "Current Economic climate and Bates | Past Presidents | Bates College". www.bates.edu. Retrieved August 11, 2018. ^ "Budget FAQs | Past Presidents | Bates College". www.bates.edu. Retrieved August 11, 2018. ^ Goldberg, Hannah (January 29, 2014). "Tensions fume in divestment discussion | The Bates Student". www.thebatesstudent.com. Retrieved August 11, 2018. ^ a b Clayton, Spencer (January 21, 2014). "President Clayton Spencer's statement on climate change and divestment". Retrieved August 11, 2018. ^ "Comedian Maria Bamford Finds Humor In Uncomfortable Topics". NPR.org. May 27, 2016. Retrieved August 11, 2018. ^ "Newman's Own Letter". www.bates.edu. November 1, 2008. Retrieved August 11, 2018. ^ Levy, Shawn. "A Neat Bit of Newman-iana Surfaces". Archived from the original on 2016-08-17. Retrieved August 11, 2018. ^ "Newman's Day, Why Beer Comes in Cases". America Fun Fact of the Day. August 24, 2011. Retrieved August 11, 2018. ^ Reilly, Rick (July 17, 2006). "With This Ring, I Bust Thy Chops". Retrieved August 11, 2018. ^ Wingfield, Brian (October 4, 2011). "America's Most Expensive Colleges". Forbes. Retrieved August 11, 2018. ^ "'Apples to oranges' comparison creates misleading impression of Bates cost". www.bates.edu. July 1, 2011. Retrieved August 11, 2018. Alfred, Williams Anthony. Bates College and Its Background. (1936) Online Deposit. Bates College Archives. Bates College Catalog. (1956–2017). 2017 Catalog. Bates College Archives. Maine State Seminary Records. 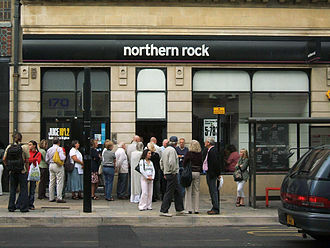 Online Deposit. Bates College Archives. Bates College Oral History Project. [permanent dead link] Online Deposit. Smith, Dana. Bates College – U. S. Navy V-12 Program Collection. (1943) Online Deposit. Emeline Cheney; Burlingame, Aldrich. The story of the life and work of Oren Burbank Cheney, founder and first president of Bates College. (1907) Online Version. The conference name is commonly used to refer to those eleven schools as a group. Many of the schools draw parallels to the caliber of schools in the Ivy League. The term NESCAC has connotations of excellence and selectivity in admissions. All eleven colleges place in the top 15% of the 2016 U. S. News & World Report, the conference originated with an agreement among Amherst, Bowdoin and Williams in 1955. 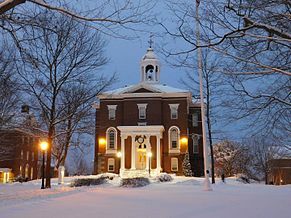 In 1971, Colby, Middlebury, Trinity and Union College joined on, Union withdrew in 1977 and was replaced by Connecticut College in 1982. The members are grouped within the NCAA Division III athletic conference, members of the conference have some of the largest financial endowment of any liberal arts colleges in the world, with Williams Colleges the highest at $2.3 billion. Undergraduate enrollment at the ranges from about 1,792 to 5,200. As of 2016, Williams College has an endowment of $2.3 billion, each college receives millions of dollars in research grants and other subsidies from federal and state governments. Williams began its football season in 1881 and its rivalry with Amherst College is one of the longest at any level of college football. Colby began its now most notable hockey rivalry, with Bowdoin in 1922, in 1899, Amherst and Williams schools first began to compete together as the Triangular League. Since they have continued to each other in most sports on a regular basis. The conference originated with an agreement among Amherst, Wesleyan, in 1971, Colby, Middlebury, Trinity and Union College joined on and the NESCAC was officially formed. Union withdrew in 1977, and was replaced by Connecticut College in 1982, the schools share a similar philosophy for intercollegiate athletics. The Conference was created out of a concern for the direction of intercollegiate athletic programs, due to the prestigious reputations of its member schools, the NESCAC is able to attract many of the most athletically and intellectually gifted student-athletes in the country. Members stress that intercollegiate athletic programs should operate in harmony with the mission of each institution. Lewiston is the most central city in Androscoggin County in the U. S. state of Maine, and the second-largest city in the state. The population was 36,592 at the 2010 census and it is part of the extended Portland-Lewiston-South Portland, combined statistical area, which has a combined population 621,219 as of 2006 estimates. 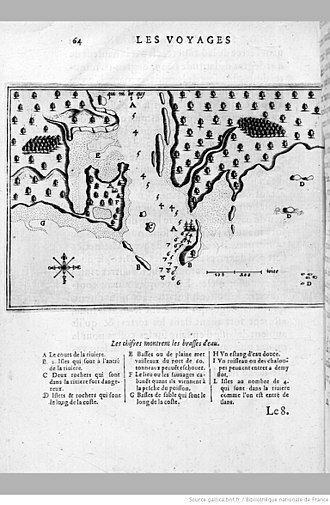 The city has historical French-Canadian connections, as development of the city occurred during the migration of French-Canadians from Montreal. A former mill town, it is located in south-central Maine, at the falls of the Androscoggin River and Auburn are often considered a single entity and referred to as Lewiston–Auburn, colloquially abbreviated as L-A or L/A. They have a population of 59,647 people. Together, Lewiston-Auburn is somewhat smaller than Maines largest city, the city holds the colleges Museum of Art. The Lewiston area was inhabited by peoples of the Androscoggin tribe. The Androscoggins were a tribe of the Abenaki nation, facing annihilation from English attacks and epidemics of new infectious diseases, the Androscoggins started to emigrate to Quebec circa 1669. They were driven out of the area in 1680, sometime after King Philips War and Little named the new town Lewistown. Paul Hildreth was the first man to settle in Lewiston in the fall of 1770, by 1795, Lewiston was officially incorporated as a town. At least four houses that have survived from this period are listed on the National Register of Historic Places. King Avenue and Ralph Avenue were named after Ralph Luthor King, Elliott Avenue was named after his wife, Grace O. Elliott, whose son eventually built the family home at 40 Wellman Street. Lewiston was a slow but steadily growing farm town throughout its early history, by the early-to-mid-19th century, however, as water power was being honed, Lewistons location on the Androscoggin River would prove to make it a perfect location for emerging industry. In 1809, Michael Little built a wooden sawmill next to the falls. Burned in 1814 by an arsonist, it was rebuilt, in 1836, local entrepreneurs—predominantly the Little family and friends—formed the Androscoggin Falls Dam, Lock & Canal Company. A liberal arts college is a college with an emphasis on undergraduate study in the liberal arts and sciences. A liberal arts college aims to impart a broad knowledge and develop general intellectual capacities, in contrast to a professional, vocational. Other researchers have adopted similar definitions, most liberal arts colleges outside of the United States follow this model. Liberal arts colleges are distinguished from other types of higher education chiefly by their generalist curricula and these attributes have various secondary effects in terms of administration as well as student experience. For example, class size is much lower at liberal arts colleges than at universities. Many students select liberal arts colleges with precisely this sense of connection in mind. From an administrative standpoint, the size of liberal arts colleges contributes to their cohesion. Job satisfaction is higher in liberal arts colleges, for both faculty and staff. In addition, most liberal arts colleges are residential, which means students live and learn away from home. The distinctiveness of these attributes is somewhat eroded by the tendency of universities to adopt aspects of the arts college. In addition, some universities have maintained a sub-unit that preserves many aspects of the arts college. Liberal arts colleges themselves sometimes cluster to offer greater curricular breadth or share other resources, most liberal arts colleges nowadays, offer more than just liberal arts subjects, such as computer science from the formal science discipline. Liberal arts colleges are found in all parts of the world, the Global Liberal Arts Alliance, which incorporates institutions on five continents, refers to itself as an international, multilateral partnership of American style liberal arts institutions. These colleges served as a means of spreading a basically European cultural model across the new country, the model proliferated in the 19th century, some 212 small liberal arts colleges were established between 1850 and 1899. 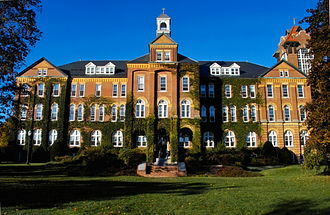 As of 1987, there were about 540 liberal arts colleges in the United States, the oldest liberal arts college in America is considered to be Washington College, the first college chartered after American independence. Charles Sumner was an American politician and senator from Massachusetts. During Reconstruction, he fought to minimize the power of the ex-Confederates, in the speech, Sumner characterized the attackers cousin, South Carolina Senator Andrew Butler, a Democrat, as a pimp for slavery. The episode played a role in the coming of the Civil War. 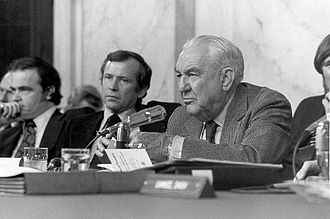 During the war Sumner was a leader of the Radical Republican faction that criticized President Abraham Lincoln for being too moderate on the South, Sumners expertise and energy made him a powerful chairman of the Senate Committee on Foreign Relations. Sumner, teaming with House leader Thaddeus Stevens, battled Andrew Johnsons reconstruction plans, although Sumner forcefully advocated the annexation of Alaska in the Senate, he was against the annexation of the Dominican Republic, known by the name of its capital, Santo Domingo. After leading Senators to defeat President Ulysses S. Grants Santo Domingo Treaty in 1870, Sumner broke with Grant, and denounced him in such terms that reconciliation was impossible. 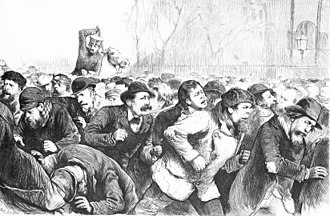 In 1871, President Grant and his Secretary of State Hamilton Fish retaliated, through Grants supporters in the Senate, Sumner had become convinced that Grant was a corrupt despot and that the success of Reconstruction policies called for new national leadership. Sumner bitterly opposed Grants reelection by supporting the Liberal Republican candidate Horace Greeley in 1872, less than two years later, he died in office. Sumner was born on Irving Street in Boston on January 6,1811 and his father had been born in poverty and his mother shared a similar background and worked as a seamstress prior to her marriage. Sumners parents were described as formal and undemonstrative. In 1825 Charles P. Sumner became Sheriff of Suffolk County, the family attended Trinity Church, but after 1825, the family occupied a pew in Kings Chapel. Sumners father hated slavery and told Sumner that freeing the slaves would do us no good unless they were treated equally by society, Sumner was a close associate of William Ellery Channing, an influential Unitarian minister in Boston. Colby College is a private liberal arts college located near Waterville, United States. Colby was founded in 1813, and is named after prominent Baptist preacher Gardner Colby, approximately 1,800 students from more than 60 countries are enrolled annually. The college offers 54 major fields of study and 30 minors, among national liberal arts colleges, Colby was ranked 12th by U. S. News & World Report, 19th by Forbes, and 21st by Washington Monthly. Located in central Maine, the 714-acre Neo-Georgian campus sits atop Mayflower Hill and overlooks downtown Waterville, the college competes in the NESCAC conference as the White Mules, and is a member of the Colby-Bates-Bowdoin Consortium, an athletic rivalry and academic exchange program. On February 27,1813, the Commonwealth of Massachusetts, led by Baptists, adopted a petition to establish the Maine Literary and it was moved to Waterville and used 179 acres of land donated by citizens. In 1818, trustees assigned the institution to Rev. Jeremiah Chaplin, after Maine separated from Massachusetts in 1820, the first Maine legislature affirmed the Massachusetts charter for the institution, but made significant changes. The Maine Literary and Theological Institution was renamed Waterville College on February 5,1821, and four years later, in 1833, Rev. Rufus Babcock became Colbys second president, and students formed the nations first college-based anti-slavery society. In 1845, the colleges first Greek Society was formed, a chapter of Delta Kappa Epsilon, during the Civil War, many young men were called away from school to join the fight, from Waterville College, Richard C. Twenty-seven Waterville College students perished in the war, and more than 100 men from the town, in the years following the war, as was the case at many American colleges, Waterville College was left with few students remaining to pay the bills and a depleted endowment. The college was on the verge of closing, Trustees of the college voted to construct a library and chapel to honor the Colby men who died in the war, called the Memorial Hall, it was dedicated at the commencement of 1869. The college remained isolated from neighboring Bates College, and Bowdoin College due to location in Waterville, coupled with socio-economic. At the 1871 commencement, a Martin Milmore sculpture based on the Lion of Lucerne was added as the centerpiece of the building, in the fall of 1871, Colby University was the first all-male college in New England to accept female students. The national Sigma Kappa sorority was founded at Colby in 1874 by the colleges first five female students, however the college resegregated them in 1890. One of the buildings is named after the first woman to attend, Mary Caffrey Low, students published the first issue of The Colby Echo in 1877. On January 25,1899, Colby president Nathaniel Butler Jr.73, in 1920, Colby celebrated its centennial, marking not the date of the original charter, but the date of its charter from the new State of Maine in 1820. Franklin W. Johnson was appointed president of the college in June 1929 and that same year saw the public release of the Maine Higher Education Survey Report, which gave Colbys campus a less than desirable review. Using the report as justification, President Johnson presented a proposal to move the college to an adequate location to the Trustees on June 14,1929. 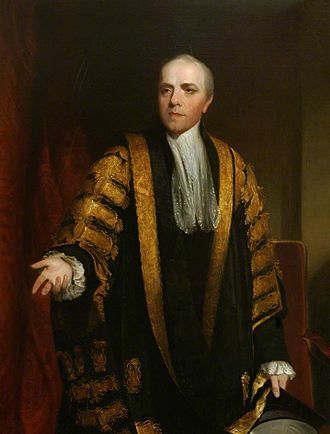 Rail and textile tycoon Benjamin Bates. Child going to work at 5:30 a.m. in Lewiston, 1909. Photo by Lewis Hine. 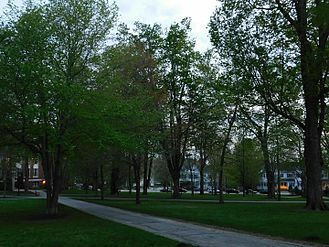 The campus of Bates College includes a 133-acre main area, in Lewiston, Maine and a 600-acre Bates-Morse Mountain Conservation Area in Phippsburg, Maine. Bates participates in laying of the Ivy at graduations and induction ceremonies while Bowdoin participates in "Ivies", a weekend event usually in the spring marked with parties and inductions. The 1901 Williams College football team posing for a photo in the yearbook. The mascot of Tufts University is the elephant. The college's main basketball courts are located in Alumni Gymnasium(pictured). Alexander De Witt advised Bates on development strategy in Lewiston. Spencer was inaugurated on the historical quad in July 2012.